One day the great god Shiva promised paradise to all those who had worshiped him in the form of the lingam at the temple of Somnath in Gujarat. Heard about it, all men and all women of any kind, good and bad, saints and sinners, young and old, went on a pilgrimage to Somnath to worship the lingam and obtain heaven. Shiva had made ​​the promise and could not retract it and so the heaven became too crowded. The other Gods began to complain about the crowding and confusion, someone said that even under these conditions had become more livable hell then heaven. 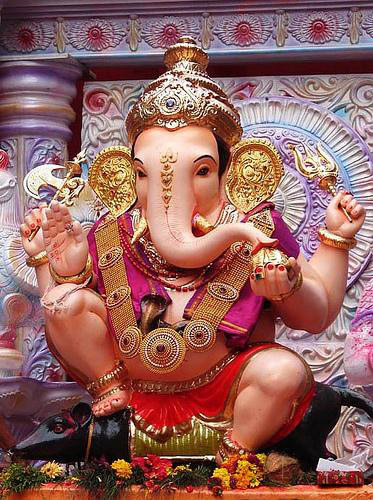 It was decided to ask for help to God who solves every problem, Ganesh. "Where are you going in such large numbers?" "Do you not know - answered - we go to worship Mahadeva who promised us heaven!" "What fools - Ganesh said - I do not think a good thing to promise something to someone when he'll dead, worshiped me and you'll get now, in life, everything you want." "You - Ganesh said pointing to a man - what do you want?" "A beautiful house - he replied - and plenty of food." And so it was. Ganesh made ​​him have a beautiful home filled with all the most delicious food. "We want a child!" cried then a married couple who were suffered satisfied. "I want to be passed at school," said a boy who, thanks to Ganapati, brilliantly passed his exams. People no longer wanted to go to heaven but to live a better life. Heaven, with great joy of the Gods emptied gradually, and people returning home told about God that answered prayers on this earth. For this reason, Ganesh, son of Shiva and Parvati, has become the most popular deity in all India. Ciao Domenico, mi viene in mente solo di chiederti dove posso trovare questo dio.... Franca. ps sto bene anch'io grazie. Intendi dire una statua o un'immagine? Io mi accontento di poco soldi amore salute in questo ordine. Buona giornata Franca.